Flatfoot Fox, the smartest detective in the world, is the main character in the Flatfoot Fox series of beginning chapter books. 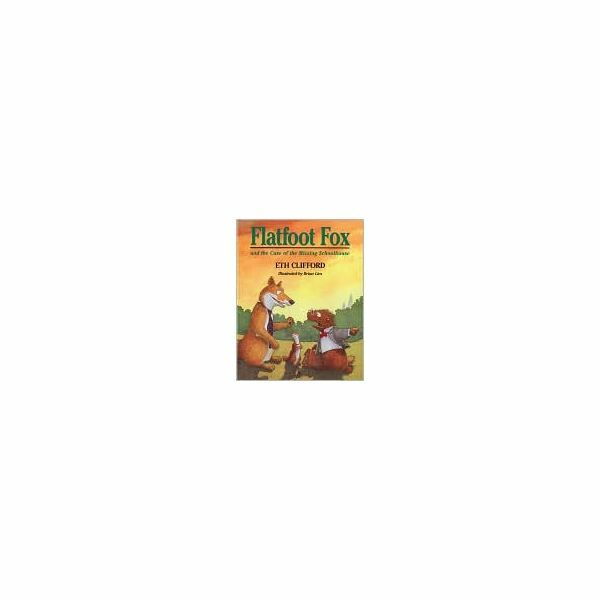 In this book, Flatfoot Fox and the Case of the Missing Schoolhouse, the detective faces his toughest case yet. A schoolhouse is missing! As they progress through the book, your students will practice predicting outcomes for each chapter based on the title of the chapter. Each character in the Flatfoot Fox series has a name that describes the character in some way. Before beginning the book, discuss the names and what they could mean. It could give the reader a clue to solve the mystery. Many of the character names use alliteration. This means they have the same beginning letter or sound in each word of the name. The characters are all animals and have actions/personalities that go along with the persona of the animal. For example: Smelly Skunk seems to have a fitting name. Flatfoot Fox: A “flatfoot” is an old nickname for a detective or policeman. Wacky Weasel: wacky means funny, odd, peculiar. Believable Badger: believable is seeming to be true or real. Smelly Skunk: smelly means having a bad odor. Daffy Armadillo: daffy means silly, eccentric. If you have a set of the books, you can have the entire class or a reading group read the book aloud or silently. Before each chapter, discuss together what they think will happen based on the chapter title. What are some ways that a building could be considered missing? A fire or some kind of catastrophe; someone has made a mistake and it is not really gone; it was never there to begin with. What could make this mystery different from the others that Flatfoot Fox has solved? What does “whsssssssh” mean? What could have happened that made the schoolhouse disappear so quickly? Could magic have made the school disappear? Use the character names to who you think the magicians are? What does it mean to dare someone? Is it like a challenge or contest? Would a “dee-double-dare” be a stronger kind of dare? Sensible means using good judgment, making sense. Of all of the characters, who do you think will ask a sensible question? Have your parents ever said, “We will do something in a little while.”? Sometimes it feels like a long time and sometimes it is a short time. What do you think that Secretary Bird and Flatfoot Fox are waiting for? When a chapter is completed, briefly discuss whether the predictions came close to what actually happened in the book. When students are predicting outcomes, it gives them a purpose for reading. They want to find out if they have guessed what is going to happen. It may help them focus on the content. This technique should be used in other books such as science, social studies and so forth. Predicting outcomes in beginning chapter books may seem like a simple activity but it is a good skill to reinforce with young readers. If students learn to study the title of each chapter before reading, it will give them a purpose or focus to the reading. This skill can then be applied to text books in other subjects.